Now that we have covered the Verizon vs T-Mobile, AT&T and Sprint state of 3G, 4G, and every other carrier network "G" in terms of coverage, download speeds, latency, uploads, stability, and so on, it's time to get detailed breakdowns by types of usage. 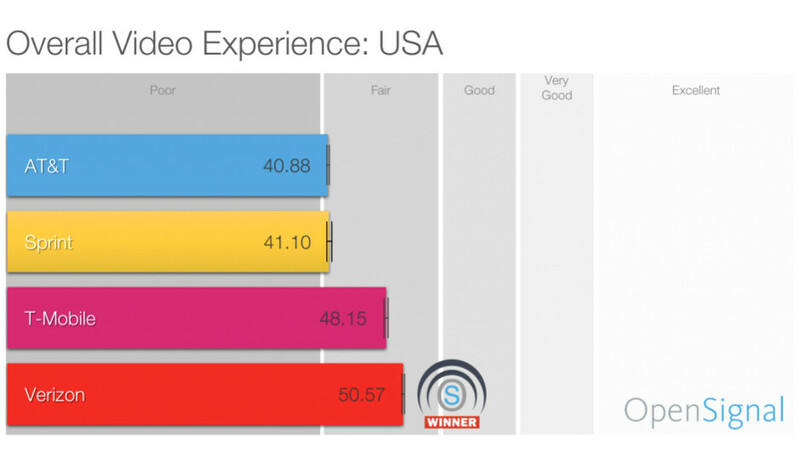 Research and network testing firm OpenSignal does exactly that with its latest "Overall Video Experience: USA" report, covering the June-September 2018 period. In it, it measures the performance of carrier networks when it comes to streaming the all-important mobile video, from YouTube to Netflix, and everything that's in-between these days. The tests are done with the International Telecommunication Union's (ITU) methodology for gauging video quality. The three main criteria are latency before the video stream begins, resolution, and amount of playback stutters or hiccups. Thus, average LTE download speeds don't always correspond to the same place in the rankings when it comes to video quality. It turned out that Verizon scored the highest in overall video experience based on latency and playback smoothness, followed by T-Mobile and Sprint. AT&T came up at the surprising last place, even though it is now deep into the media business with the Time Warner purchase, and is readying an HBO-based video streaming service to rival Netflix and the like. Not first, but somewhere at the top of the big four. I doubt they can replicate this test and make it consistently produce the same results.